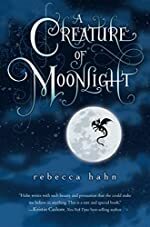 A Creature of Moonlight by Rebecca Hahn. Review: Have you ever wondered what's behind those trees, beyond the mountains, in the deepest caves? Well you're about to find out and explore the secrets and stories of the woods by reading A Creature of Moonlight by Rebecca Hahn. Come along on Marni's journey to find where she belongs, to the forest or the cottage? Marni is a flower girl who lives with her gramps in a cottage not far from her village. She has always wandered off into the forbidden forest behind her house; people have forbidden it because girls have been snatched away by the dragon. Marni is the dragon's daughter, daughter and the woods are calling even louder for her to home to her father. Marni's uncle is the king, and wants Marni's head for being the dragon's daughter. Her uncle killed her mother for carrying the Dragon's Daughter. Marni now wants vengeance for her mother's death, and the only way is to kill the king. Now the woods are coming in fast and Marni needs to make her decision. Which way she will go for her future? The princess or the Dragon's daughter in the woods? A Creature of Moonlight is a perfect book for my grade level and age group. It is very enjoyable and a good book for my liking. I definitely recommend it to anybody and I want a second book! I would read it again! I think the plot is very creative and the charters to. Also the description is so real it's just as magical as the woods in the story! We would like to thank Houghton Mifflin Harcourt for providing a copy of A Creature of Moonlight for this review. Have you read A Creature of Moonlight? How would you rate it?